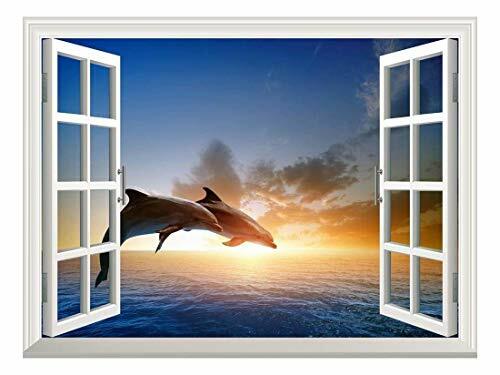 wall26 Removable Wall Sticker/Wall Mural - Beautiful Couple Jumping Dolphins at Sea Sunset | Creative Window View Home Decor/Wall Decor - 24"x32"
This is the fifth wall mural I ordered from Wall26. I love the vivid colors. It looks great on my bathroom wall. Removing the backing should be done with care, patience is very important. It looks beautiful, I am going to buy another one. This product came in rolled up so tightly that it took me three days to flatten it. They should have used a poster canister. The product itself is very thick so as a result very hard to get rid of bubbles and creases. The glue is so sticky that it ripped the paint off the wall and exposed the sheetrock underneath. I would have returned it but couldn't without serious damage to the wall. I will eventually remove it because it's full of creases but can't now since I don't have time for wall repairs. I read the reviews where people describe the product as being very forgiving. Either they're reviewing the wrong product or the product has changed since. I am a handy person and this isn't a user error. Three stars cause the scenery and the layout is beautiful. Great I put it on the front wall of my R-Pod travel trailer, really opened up the area and looks great, easy to put up!